The so-called “prevented planting” component of the federal crop insurance program is wasting billions of dollars while encouraging growers to plow up wildlife-sustaining wetlands in the iconic Prairie Pothole Region of North and South Dakota. Sign up to receive email action alerts and more from EWG Midwest – including our Midwest newsletter (published every 4-6 weeks). You can opt-out at any time. “Prevented planting” crop insurance is supposed to compensate growers when extreme weather or other factors make it impossible to plant their crops. The program, however, has proved to be unworkable in the Prarie Pothole Region, despite repeated attempts by USDA’s Risk Management Agency to tighten the rules governing the coverage. The reason is simple. The “potholes” in the aptly named region are actually seasonal wetlands that are wet or flooded in the spring but dry out in the summer or fall. Inability to plant these seasonal wetlands is the norm. As a result, the primary cause of loss that generates payouts is excess moisture, and the most payouts go to counties with the most seasonal wetlands – where “excess moisture” in springtime is entirely predictable. The 195 counties in the region generated a whopping $4.9 billion in payouts for excessive moisture – 61 percent of all prevented planting payouts nationwide. Sixty-five counties – the dark blue area in the interactive map below – generated payouts for excessive moisture 14 years in a row and accounted for fully 69 percent of the $4.9 billion. Those 65 counties got more in prevented planting payouts than they did in so called "direct payments" – the most generous farm subsidy program during that period. As crop prices soared between 2007 and 2012, payouts were nearly double the direct payments. Another 29 counties had excessive moisture claims paid in 13 of the 14 years. Together, these 94 counties account for an astounding 90 percent ($4.4 billion) of all payouts due to excessive moisture in the region, and 55 percent of all such payouts nationwide. The prevented planting provisions of the crop insurance program are operating more like an income support program than an insurance program for a handful of counties that encompass 69 percent of the total wetland area in the Prairie Pothole Region. This is truly bad news for taxpayers and the environment. To its credit, USDA’s Risk Management Agency has tried repeatedly to refine the standards that loss adjusters must meet when determining whether a prevented planting payout should be made. The crux of the matter is determining whether the acreage on which a claim is being made can actually be planted under normal conditions or only when weather is abnormally dry. The agency issued new standards in 2006, 2011 and 2012, but those actions failed to stem the tide of payouts, and the pressure on the region’s critically important wetlands intensified. In 2014, the agency issued yet another new standard to implement recommendations made by its inspector general. In short, only acreage that has been successfully planted in at least one of the previous four years will be eligible for prevented planting coverage. Once acreage fails that test, it must be successfully planted two years in a row before it can be covered again. EWG analyzed weather data to evaluate the new standard and found that it will be very easy to pass the 1-in-4 years test. It will be much harder to pass the 2-in-2 years test, but it appears unlikely that many acres will ever have to meet that more stringent requirement. It seems likely that this new fix will also fail to stem the tide of payouts or blunt the incentives to plow out seasonal wetlands. Moreover, the agency relies almost entirely on its approved insurance providers (AIPs) and the loss adjusters who work for them to apply and enforce the prevented planting rules. It is also dependent on growers to provide those adjusters with the documentation needed to evaluate claims. As a result, the agency’s inspector general reported in 2013, “loss adjusters did not document and support a required determination related to prevented planting eligibility for any of the 192 prevented planting claims we reviewed.” Since 1999, Risk Management Agency’s Inspector General and the Government Accountability Office have repeatedly issued broad criticisms of the performance of crop insurance companies and their loss adjusters and questioned whether the agency has the capacity to effectively oversee their work. The Risk Management Agency is saddled with trying to manage insurance coverage for excessive moisture in a region in which excessive moisture in springtime is the rule, rather than the exception. Rather than trying yet again to tighten its loss adjustment standards to manage an unworkable program, the agency should engage the private sector to develop insurance products – unsubsidized by taxpayers – for growers who want and are willing to pay an actuarially sound premium. The weather-based insurance developed by the Climate Corporation, for example, would be a good model to follow. If the government continues to subsidize excessive moisture coverage in the region, the Risk Management Agency will have to dramatically strengthen its loss adjustment standards and its capacity to enforce those standards to avoid the worst abuses. Denying coverage on acreage that has repeatedly generated payouts would be the most straightforward and easily enforceable standard. Such a standard would be grounded in the basic principles of insurance and be in keeping with at least some official interpretations of the statute that authorizes prevented planting coverage. Congress made it impossible for EWG to evaluate the likely impact of such a standard by imposing a veil of secrecy on records of individual federal crop insurance policies and policyholders. The abuses of this troubled program in the Prairie Pothole Region could be reduced by beefing up the agency’s capacity to utilize weather data, state-of-the-art remote sensing and additional data management tools, and by strengthening its on-the-ground compliance staff in order to oversee the work of crop insurance companies and adjusters. On balance, however, the best option for taxpayers and the environment would be to put an end to federally subsidized prevented planting coverage for excessive moisture in the Prairie Pothole Region and to look to the private sector for innovative and affordable solutions for farmers wishing to grow crops in this unique and important landscape. In the Midwest we pursue our mission by working to move agriculture in a more sustainable direction. 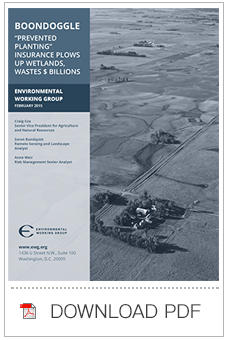 Support EWG’s ground-breaking cropland research.